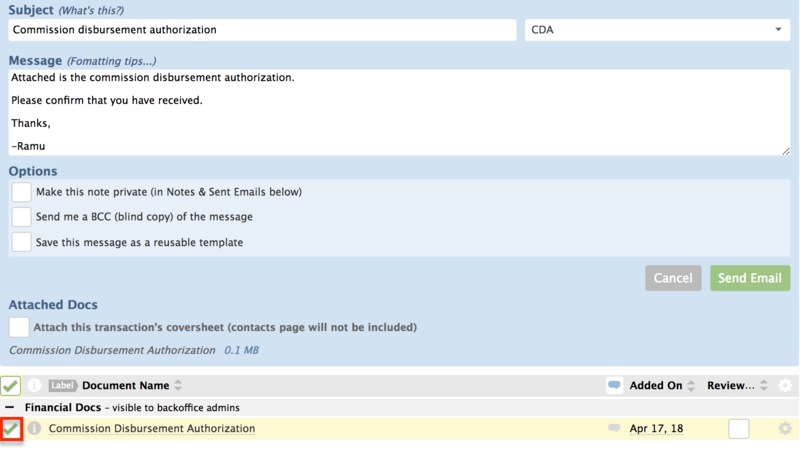 Quickly email a commission disbursement authorization from any transaction. From inside the transaction, click [Note/Email]. Enter the contact’s email address. If the person handling the closing / escrow / title / or attorney is listed as a contact, drag and drop their email address into the ‘send to an external email address’ field. Fill out the subject and body of the email. If using message templates, apply a saved template which will auto-populate the subject as well as the message text. If not using message templates, enter the subject line and type out the message. Scroll down to the docs section and select the commission disbursement authorization. Click [Send Email]. The commission disbursement authorization is on its way.